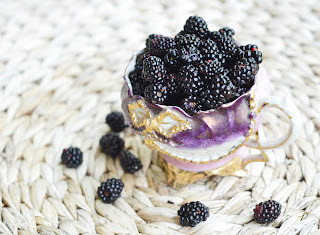 This summer I was lucky enough to be invited to a friend's farm to pick wild blackberries. I had never done this, and it was so much fun! I was dropped off in the middle of a blackberry patch and told to have at it. I came away with almost a gallon of blackberries and immediately froze them for later use. I used some in a Blackberry Peach Cake (yum! ), but still had a ton left. I finally settled on a blackberry gelato from the Ciao Bella Book of Gelato and Sorbetto cookbook. My husband had bought it for me as a gift last year, and for some reason, I had never gotten around to trying anything. Besides never having used this cookbook, I had never made a custard-based ice cream. I was always scared that the eggs would cook and I'd end up with curdled ice cream, but it turns out that it's much easier than I thought it would be! I served this wild blackberry gelato with some chopped sugared peaches, and it was the perfect accompaniment to the slightly sour wild berries. The gelato was creamy and delicious--so much so that I can't wait to try my hand at other flavors from this book! In a heavy saucepan, combine the milk and cream. Over medium-low heat, cook, stirring occasionally so that a skin does not form, until small bubbles start to form around the edges and the mixture reaches 170 degrees F.
Meanwhile, in a medium heat-proof bowl, whisk the egg yolks until smooth. Whisk in 2/3 cup of sugar slowly until it is thick and pale yellow. Pour a little of the hot milk into the egg mixture while whisking continuously. (This is to make sure that the eggs don't cook.) Continue pouring the hot milk mixture into the eggs, whisking all the while, until fully incorporated. Return the custard to the saucepan and turn the heat to low. Cook, stirring frequently with a wooden spoon, until the custard is thick and coats the back of the spoon. (It should reach about 185 degrees F.) Do not boil. Pour the mixture through a fine sieve into a clean bowl and set in an ice bath, stirring occasionally until the custard is cooled. Cover and refrigerate at least four hours or overnight. Combine the blackberries, 2 Tbl sugar, and lemon juice in a food processor and puree. Pour into a fine sieve and press down on the solids to extract the liquid. Throw the solids away. Cover and refrigerate for one hour. Once the custard and blackberry liquid have refrigerated, gently whisk the blackberry puree into the custard. Pour the mixture into an ice cream machine and follow the manufacturer's directions. Transfer to a container and freeze for at least two hours before serving. Nice blog you have here. Blueberry gelato looking delish. Love the pics. Gorgeous color! Wish I had access to more fresh berries than just strawberries. Although I do love my strawberries. This looks so refreshing! Delicious. I am partial to good ice cream. I hate the from the bucket stuff but a good quality homemade ice cream or gelato is divine. Great photos, too! One of my favorite travel memories is from a visit to my best friend while she was working in Cape Cod. There was a wild blackberry bush growing in the front yard of her rental house and we picked berries while catching up and then made the best blackberry crisp. 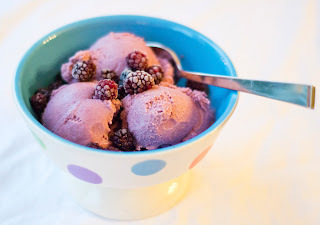 I made a blackberry ice cream a couple of years ago and loved it. Yours looks divine! Lucky you that you went blackberry picking! This gelato looks beautiful and delicious! I'm on the wait list to get this book out of the library, I can't wait! It's not gelato. It's icecream gelato does not have cream in it, only milk. cao linh chi han quoc san pham duoc bao che duoi dang cao linh chi co dac 100% gom chiet xuat chu yeu tu nam linh chi va tinh chat nhan sam 6 nam tuoi ngoai ra cao sam linh chi con co nhung vi thuoc quy, dac biet o xu Han. cao sam linh chi han quoc doc dao giup tang cuong suc khoe giai doc co the nhanh chong, cao linh chi nhan sam ho tro phong ngua benh tat vo cung hieu qua.